Homeopathic remedies will help reduce a ganglion cyst without surgert. Contact us to learn more! Ganglion cyst is a term used to describe a mass or swelling that forms on or around joints or tendons, in the wrists, ankle, top of the foot, near the toes sometimes knees or elbows but they can be found on the spine as well as other parts of the body. They are benign, they typically look like tumors which are filled with a clear fluid, and as they get larger in size they put pressure on the nerves, joint or surrounding tissue which can become irritated and painful. They can be small or large, soft or hard. Pulling and acute drawing pains in the forearms, the wrists and fingers. Relaxation of the muscles of the arms and of the hands on laughing. Tension in the joints of the hand, as if they were too short. Cramp-like contraction of the hands. Heat of the hands, burning in the hands. Icy-cold hands. The tips of the fingers are covered with cold sweat. Paralytic weakness of the wrists and of the fingers, especially on grasping an object. Vitality has become weakened or exhausted. Persons who have never fully recovered from the exhausting effects of some previous illness. Weakness of memory and slowness of thought. Contraction and induration of the tendons of the fingers. Pains in the arms at night. Drawing pains and acute pulling, in the arms and hands. Convulsive movements in the arms. Itching and eruptions on the arms. Warts on the arms. Shooting pains in the front part of the arms, from the fingers to the elbow. Paralytic feeling in the right hand Tearing in right wrist-joint. Drawing pains in the hands, and the joints of the fingers. Spasmodic weakness and trembling of the hands. Itching on the fingers. Stiffness in morning on washing or with pressure. Rheumatic tearing pains in shoulders, arms and hands especially in the joints, especially at night. Burning pain in palms of hands and arms, clammy perspiration in palms and on head. Burning pain in hands and arms. Numbness of arms and hands. Weakness and trembling in arms and hand and when holding anything. Wrenching pain in joints of hands and fingers, with tension. Swelling of hands, even at night. Heat in hands. Coldness of hands at night. Contraction and jerking of fingers. Deadness of fingers. Paralysis of fingers. Numbness of finger-tips. Skin cracked at joints of fingers. Nervous or weak. Over sensitiveness of all the senses to external impressions, light, noise, odors, touch. Restless, fidgety; moves continually, cannot sit or stand still a moment. Paralytic stiffness of wrist. Wrenching pain or shootings in wrists. Sensation as from a sprain and stiffness in wrist. Bones of wrist and back of hand painful as if bruised when at rest and when moving. Pain in wrist as from a sprain on lifting a weight. Numbness and tingling in hands after exertion. Spasmodic contraction of fingers. Swollen veins on hands, worse after eating. Bruises and other mechanical injuries of bones and periosteum, sprains, fractures and especially dislocations. Bruised lame sensation all over, as after a fall or blow; worse in limbs and joints. All parts of the body upon which the person lies are painful, as if bruised. Restless, turns and changes position frequently when lying. 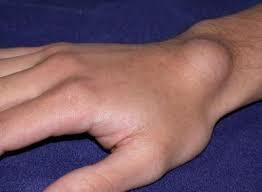 Ganglion on wrist. Ganglion on back of hand. Gnawing, purulent vesicles, with burning in fingers. Tearing, drawing, sticking pain and numbness in fingers, as if suppurating, or as if a panaritium would form. Numb feelings of a finger, as though it were enlarged and the bone swollen. Pain as from a splinter in flexor surface of one finger. Panaritium, especially with vegetations, cries and insupportable pains day and night.- Drawing and tearing in arms, hands and fingers. Heaviness and paralytic weakness of arms, which tremble on least exertion. Numbness of the forearms when lying upon them or leaning the elbows on a table. Throbbing and jerking of muscles of arm. Paralytic weakness of the forearm. Induration of the cellular tissue of the forearm. Shootings pain at night in wrist, extending to the top of arm. Tearing pain in wrists and ball of hand. Spasmodic pain in the hands and fingers. Numbness of hands at night. Paralytic weakness of hands.- Tonic spasm of hand when writing. Cramp-like pain and lameness of hand after slight exertion. Profuse sweat of the hands. Ulcer on back of hand. Tingling in fingers. Burning sensation in ends of fingers. Pain in joint of fingers, when pressed. Weakness, rigidity and lack of flexibility in fingers. Contraction of flexor tendons, very painful when moving fingers. Those who have deficient nutrition, not because food is lacking in quality or quantity, but from imperfect assimilation; oversensitive, physically and mentally. Ganglion on wrist. Sprained pain and stiffness in wrist, worse in morning. Paralytic weakness of arms and hands. Swelling of hands and thumbs. Rigidity and wrenching pain in joints of hands and fingers. Trembling of hands, especially when occupied with fine work. Involuntary contraction of hands, as if about to grasp something. Coldness in hands and fingers. Great burning in palms. Perspiration on hands (in the palms) and between the fingers. Peeling skin, 6hardness, dryness666 and cracking of skin of hands. Itching vesicles on backs of hands. Cracking and chapping on finger-joints. Burning in balls and tips of fingers. Cramps and jerks in fingers. Contraction of tendons of hands and fingers. Standing is the worst position, they cannot stand; every standing position is uncomfortable. Skin is worse after a bathing.